Bob, ZL1RS and Lance, W7GJ they are on American Samoa Islands. 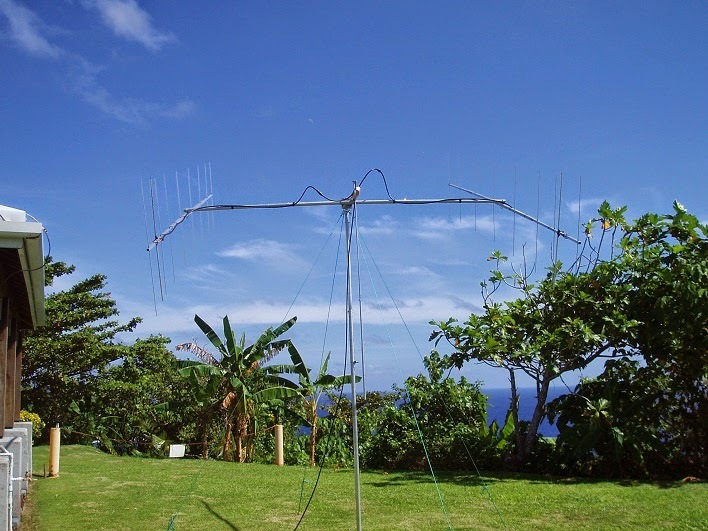 Bob is active as KH8/ZL1RS in 144 Mhz via EME and Lance is active as KH8/W7GJ in 50 Mhz band. I had already QSO with KH8/ZL1RS in 2m EME and KH8 is another new one given from Bob, ZL1RS. He has 2X9 elements antenna verticaly polarized. I was also calling during our sort common Moon window in 6m band but was not posible to copy him so far due to high noise level in my QTH during my Moon Rise. Lance, had a copy of me but QSO in 6m NOT compelted. Friday, July 18, 2015 - Fifth moon pass. I confess that I finally crashed :-( I slept 14 hours and missed the EU moonset and NA moonsets :-( However, during the EU moonrise, I worked OH6MIK, HA7TM, YU7EF and HA0DU, bringing the total 6m EME worked to 45 so far. TNX Bob and Lance to be there.